Description: Smooth dark purple stem. Leaves with three leaflets wich are further divided into 3 or 5 sub-leaflets. The flower head is a rounded, almost spherical, umbel make of clusters of small white flowers, consistent with the typical Parsley family structure. Edibility: The stems and leaf stalks can be boiled in changes of water and eaten as a cooked vegetable. Tender roots can be prepared like parsnips. Seeds can be used as a seasoning. 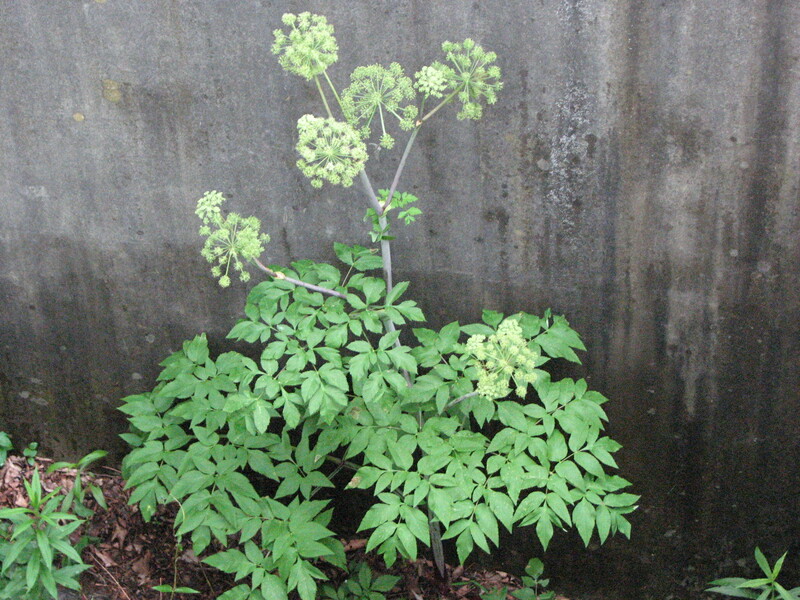 As with all members of the Parsley family, positive identification is absolutely necessary, as this plant resembles a few extremely poisonous species. Poisonous: Althought Angelica is not poisonous, it can resemble a few other extremely poisonous plants, such as Water Hemlock, Poison Hemlock, and Fool's Parsley.